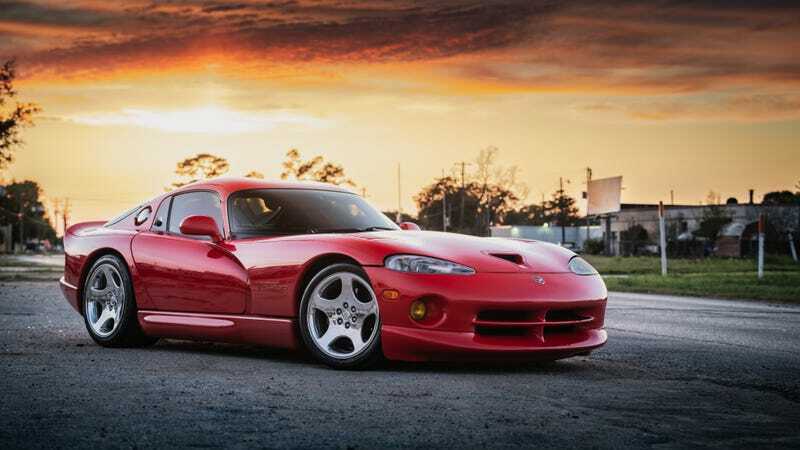 Is there anyone that doesn’t like a good Dodge Viper? It’s a V10 engine, seats, and a steering wheel, what’s not to like? I’m not usually one for chrome or polished wheels, but these happen to look quite good on this bright red snake. The lowslung Dodge bludgeon-in-a-ball-peen-suit Viper will hit you over the head with a stack of bricks and somehow you’ll still beg for more. This car is uncomfortable, loud, hot, ill-handling, and atrocious to live with, but it’s the most pure analog supercar experience possible from the Great Lakes region. As a child of Mother Michigan, I grew up learning to enjoy hateful experiences that come part and parcel with living in a frigid hellscape 6 months of the year, and as such, the pain and punishment of a Dodge Viper call to me like a siren song. I want it. But make mine an early first gen with no roof and side pipes, please. I hate/love it. This photo was taken by Nick Dennis, who also owns this nice 2002 Dodge Viper GTS. Is it nice enough to be your wallpaper this week? You decide! You can check out more of Nick’s photo work on Instagram: @nickdennisphoto.